The scroll and leaf pattern on this mid 19th century, 7" long, .9 T. oz., master butter knife was produced by Farrington & Hunnewell, and in this instance retailed by "C.A.W. Crosby," both Boston firms. A popular design in its period, examples of it are readily found. 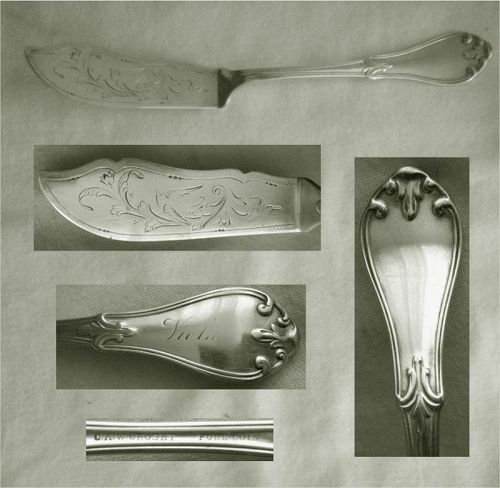 This piece stands apart, however, for the naturalistic leaf, flower, and bird motif engraved on the blade. It is also inscribed "Viola" on the backside of the handle. In good condition, it retains excellent form and the blade is free of bends, noting one slight ripple, burrs, or nicks. There is some softening of the engraving from polishing, particular evident on the name. Marks are the retailer's name and the words "pure coin," which is a New England regional term.